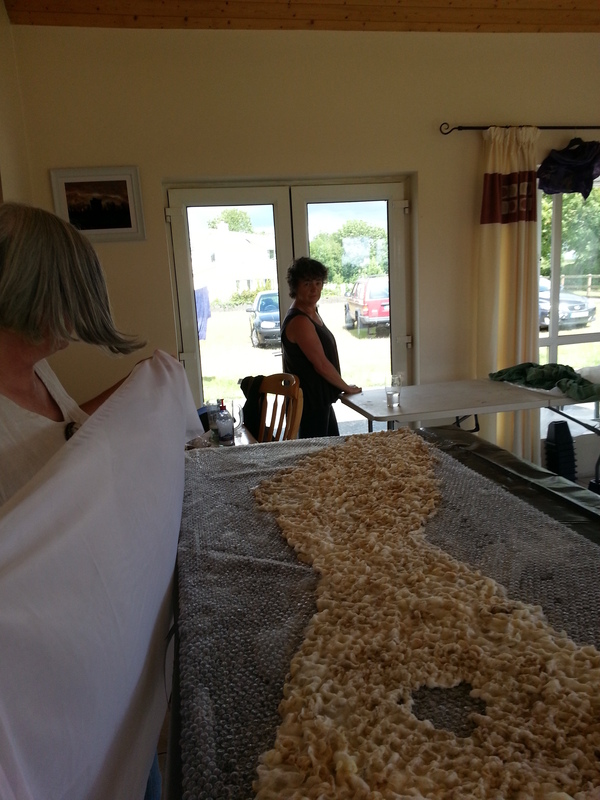 Anita Marnell Fibre Art | Felting fun in the Irish countryside. Well, I don’t know what the weather is like in other parts of the world, but here in Ireland it is pure awful. One minute you think lovely, the next it’s like winter never left. On Monday walking Stitch (our Lab) it was wet,cold and pure miserable, time to bring back out the Winter hats thought I and at this point I realised that I was actually missing creating them – so- out came a hat pattern. This one was based on a pattern Robbin from Heartfelt Silks gave me, but I have changed to suit the type of hat shape I love. I used 18micon black merino with some lovely silk hankies kindly given to me by Nicola Brown, I also used a prototype new washboard which Robbin left with me and I have to say it is brilliant, the depth of the teeth meant that the fulling was so much quicker and as it was small I could get it right into the shape. I also used the edge board for the pleat area and the brim. I just need now to razor lightly in some areas where the silk has sunk too far into the wool to bring the colours out more and it will be finished. Hope you all like. If you have any comments good or bad (yes even bad) please feel free to do so, I’d love to hear from you. Until the next blog, take care. 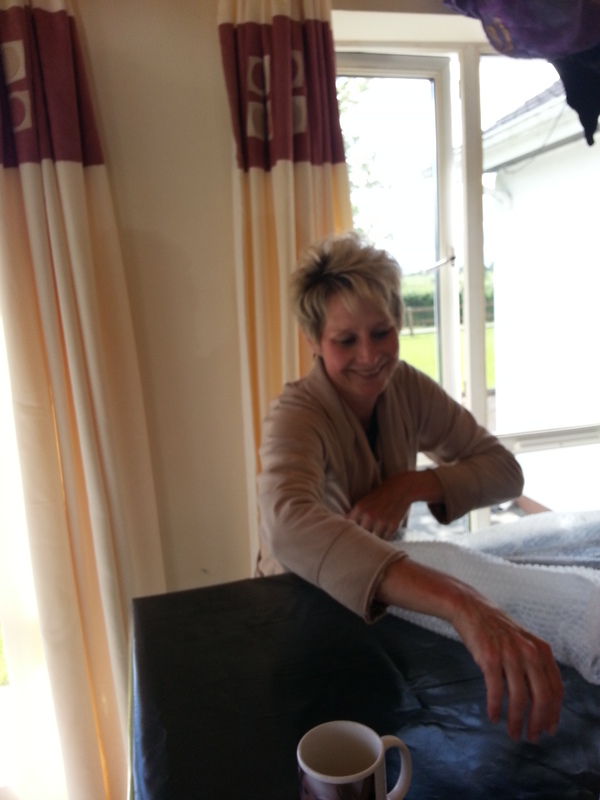 Meeting Robbin Firth of Heartfelt Silks. For those of you who follow me this post is a rare thing but I just had to write something about meeting an extrodinary and gracious lady Robbin Firth of Heartfelt Silks and her lovely daughter Kirsten. Last year we started to talk about her coming here to Ballybur to facilitate a Workshop and just over a week ago it went ahead. This being my first workshop to host with more than one or two people and as Robbin is an International tutor I wanted to make sure things were at a top standard. A great declutter took place and the result was a very happy me, the family and most of all my visitors came into a home and Studio that I was quite proud of. Anyway enough of me rambling, it was just like having old friends here instead of someone I had just met. We chatted for hours, laughed, created and had the best few days. Robbin and Kirsten went site seeing to Waterford and Kilkenny City, without me I should add, I thought about when I am away, especially with friends or visiting and I always need some time alone and space, so off they went and I have to admit it was hilarious picking up two drowned ladies from Kilkenny City armed with bags and saying how they had visited everywhere including the Castle but in lashings of rain. Oh dear here’s that ramble again. Six fabulous ladies came to the Workshop where they were to create a Cowl and a short locks scarf, (Six was my maximum number both for my Studio to the size needed for each participant but also from Robbins point allowing her time to give each individual and also for each person to benefit from Robbin.) After all introductions Robbin started to show us her techniques and how to use her Palm Washboards which are beautifully made by her husband Harry. After this I have to admit I actually didn’t get to see much more of how everyone was doing as I spent the rest of the day replenishing hot water, mopping up , tea/coffee etc. At the end of the day the feed back from everyone was that it was brilliant and they were thrilled with what they had made. A great photo shoot outside ended the festivities with a lot of laughter. I have put a name to Robbins technique with the Washboard and I call it Transitional felting. Why this, well like Nuno and other techniques it is a different way of felting, a definite mix of traditional but with some major differences (which I am not going into, I will let you follow Robbins posts for this) suffice to say you can use the Washboards from start to finish with no rolling, or depending what you are making very little. It is fast, very balanced and creates a finish which can be totally different. I can understand how felters who are used to the traditional methods will roll their eyes when they learn Robbins techniques, but they work beautifully and that is why I call it Transitional – moving into a different era or maybe a modern technique. Well for the moment that’s it other than I met a wonderful, funny,kind and helpful lady who I am now so pleased to also call a friend and I’m sure all the ladies at the workshop would agree with me. 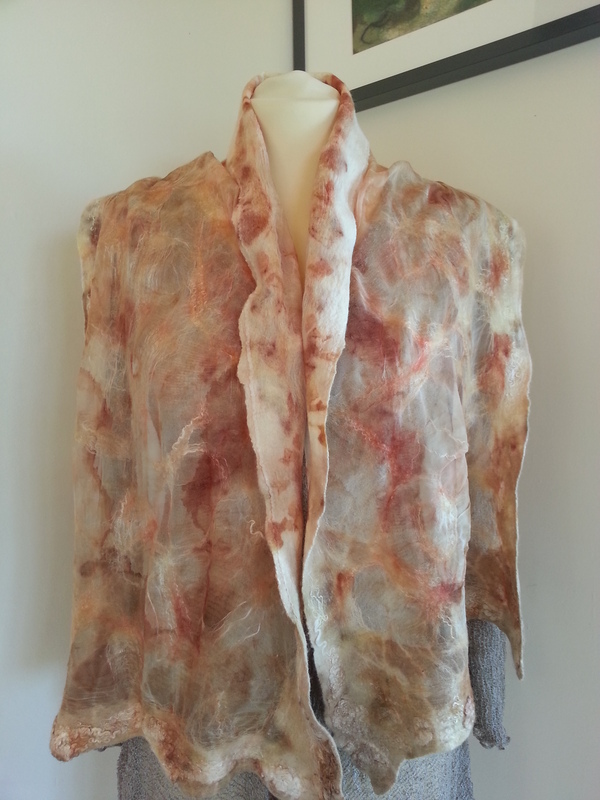 Playing with Eco dying, Exhibition & Kilkenny Arts Week. Is it just me but the Summer seems to be flying by, here we are three quarters of the way through July, glorious weather, workshops happening, spinning being done but very slowly with a lot of vm removal and I mean a lot along with tons of combing before spinning and for once I really am not enjoying it, though on the bright side hopefully a friend will have some yarn which she can knit something with. 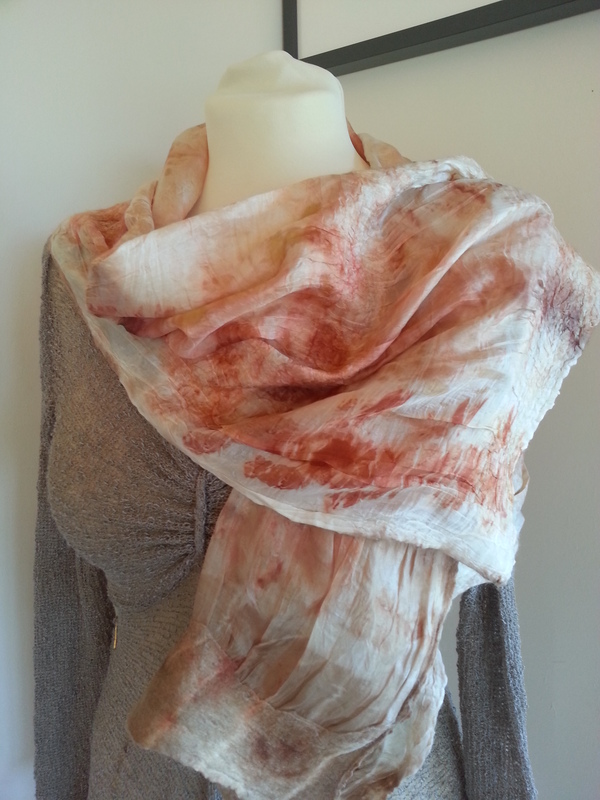 I have been playing around with Eco/natural dying something I don’t usually do but I wanted to felt light scarves, so with having plenty of white I hit the onion and eucalyptus trail. 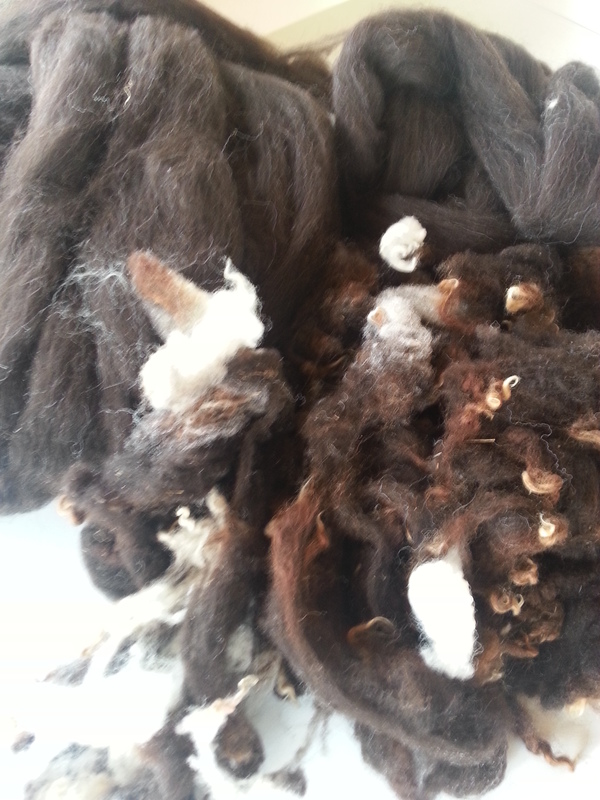 The first was a merino combed with mulberry silk on chiffon incorporating lots of silk throwsters at the ends, the second was ponge with cashmere and I personally was very pleased with the results. Both I’m going to find extremely hard to put up for sale. Anyway that’s what I’ve been upto and coming up don’t forget if you want a trip to Tramore my exhibition of landscape work and pictures starts at the Coastguard Gallery on the 13th August, at the same time I’ll be partaking in Kilkenny Arts week. Oh and there is something else looming. I just need to finalise the details, more next week. Leaving you with Eco dyed pics. 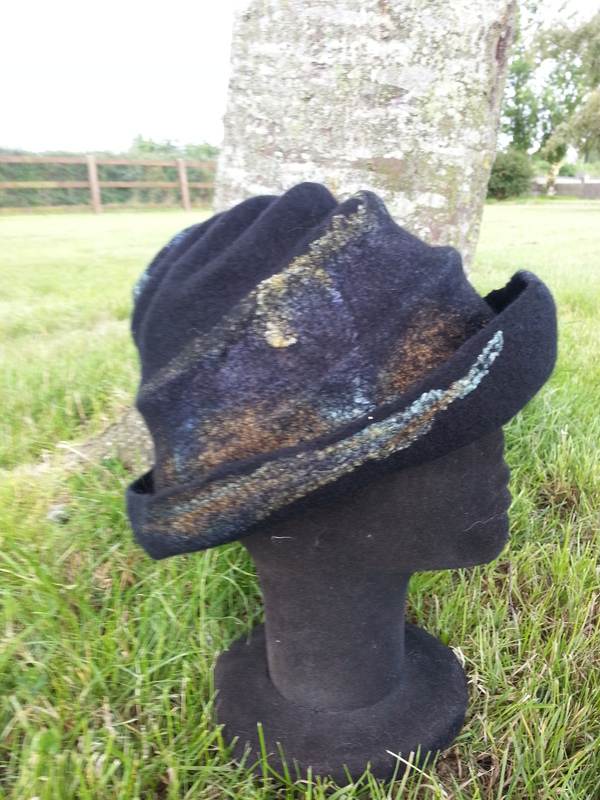 The last week or two have been funny ones, not a lot of creating or production but there again what I have done has been new designs for me, Firstly a hat in a different shape also using a merino base with a Galway mix for the outer layer and the brim. The Galway likes to felt in a different way to the merino so took some working, I have learnt in the past that less soap, copious amount of water and lots of rolling are required. It keeps its shape beautifully but I’m not overly happy with this, there are one or two areas that are just not sitting right, yet others that I love so this is still a work in progress. 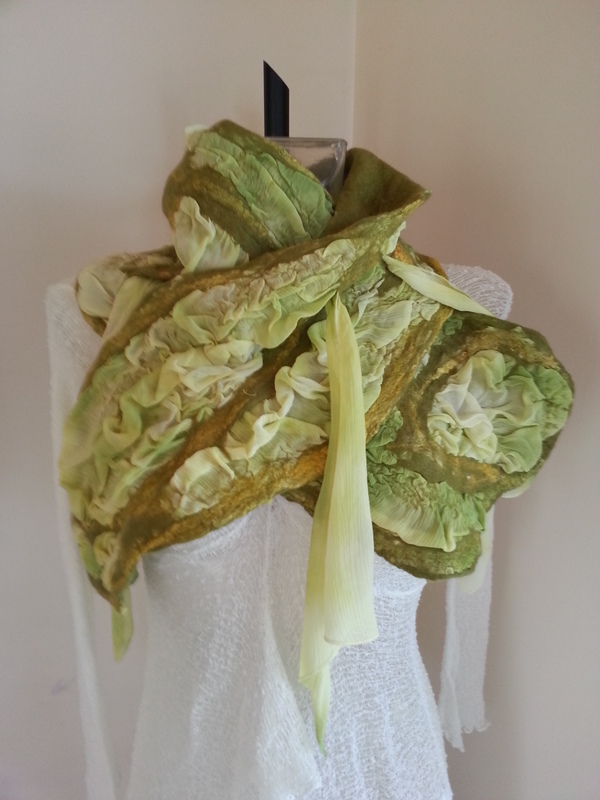 My other creation has been a Nuno Scarf and again different to my usual style including lots of material texture. Finally last Tuesday I spent a lovely day with Karen, who is a great Artist and Needle felter, her needled pictures are super, but she wanted to learn to wet felt as well and she created a fabulous abstract. Pictures of this to follow, in the meantime here’s the Nuno. On a footnote, this Friday and Saturday the Craft group are in the Carlow Shopping Centre so if any of you are around Carlow, please call in and say hello. I’ll have some lovely handspun Jacob with me as well as Leicester and Galway with a small amount of Merino. 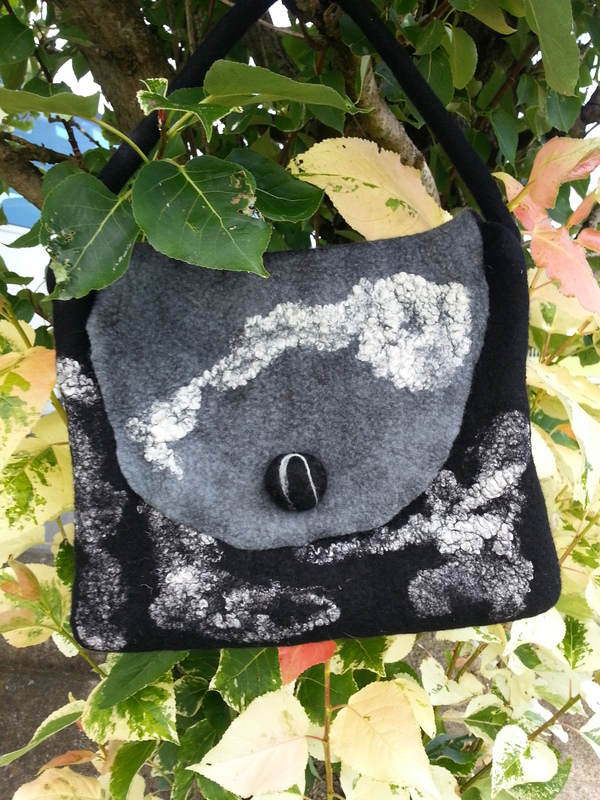 Glorious weather lots of felting, spinning and product development. Well not so much spinning but a bit. The bag from my last post is finished completely, which button would I use was the final question and after much debating and lots of in put from everyone on which colour to use, with black being the majority, but I favoured white. 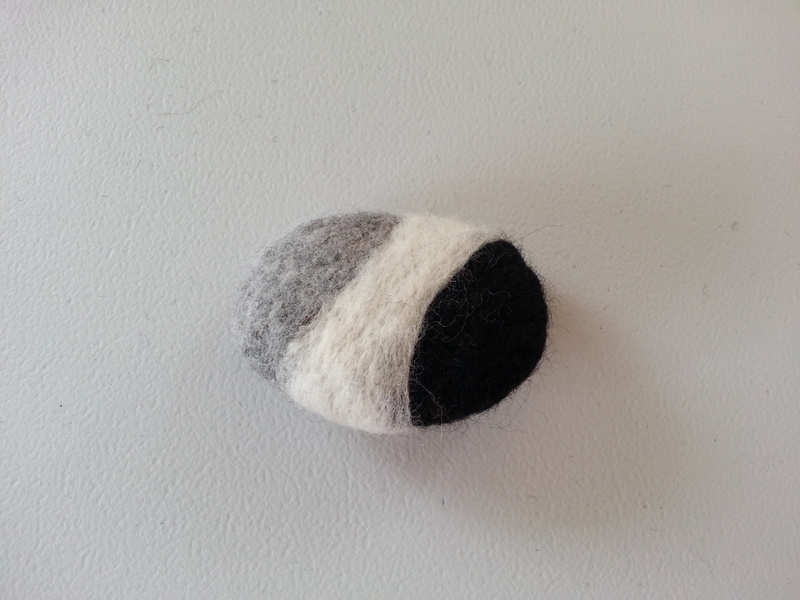 In the end I haven’t use a button I Needle felted a button shape in black with just the hint of white and attached this and used a popper as the closure. 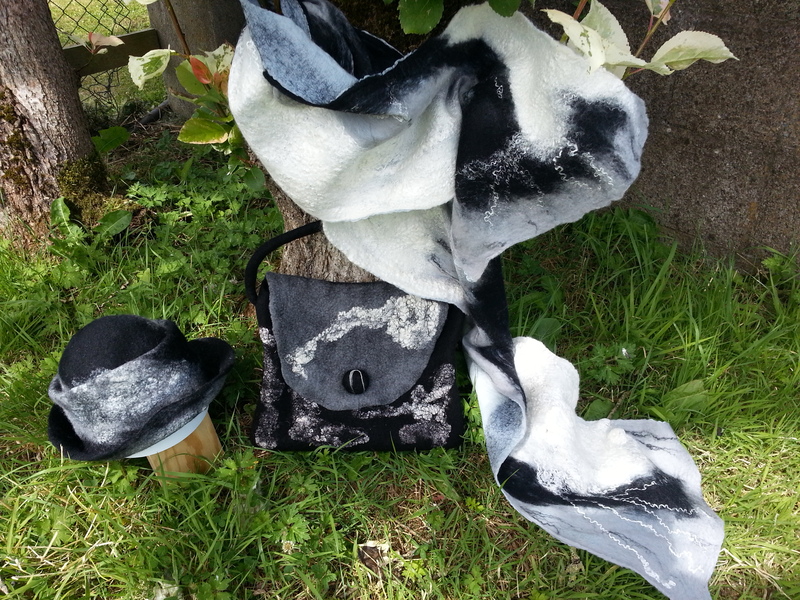 This bag was the final item to complete my set of Scarf, Bag, Hat and I needle felted a Brooch to complete the set for the scarf. On the development front well that will be over the next couple of weeks, suffice to say that it includes sewing and as that is my pet hate, it is all in collaboration with a friend, This weekend coming I’m back in Market Cross in Kilkenny City with the Craft group, so hope to some of you there. Until next time pics for you. It was a great weekend at Gowran Park Race Course. 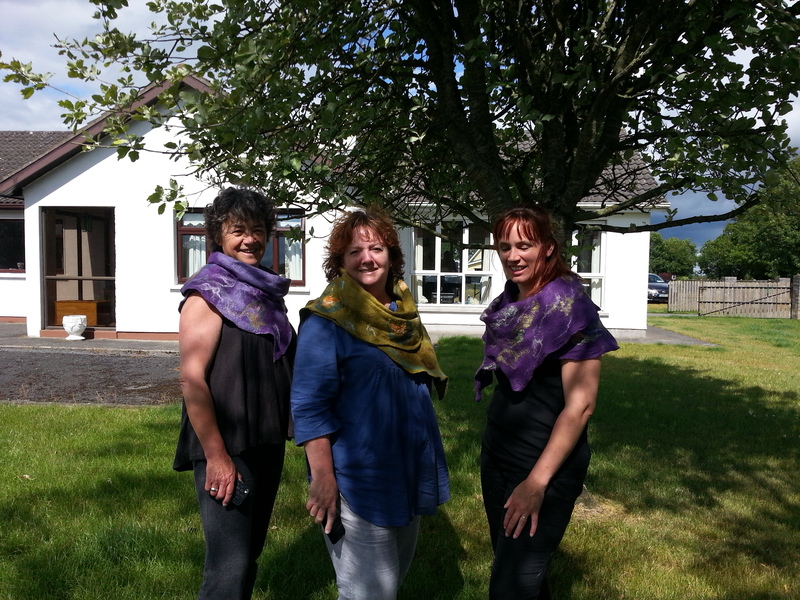 Met some fabulous people,including some lovely American ladies, who were on holiday and having a day at the races on Saturday and bought some goodies to take home with them, it was also a weekend for scarves and shawls and the funny thing was they were all purple based, which surprised me as purple has been slow to move lately, so it was a lovely surprise. Anyway down to this week, I’ve just finished felting a seascape for one of my upcoming exhibitions, it’s hanging to dry on the line and then over the next few days I’ll do any finishing needed. But after that the mental block has set in. There are two or three things in my head but I think for today I’ll settle for doing a few flowers which don’t take too much brain work, I hope, then some spinning so a chill out day. 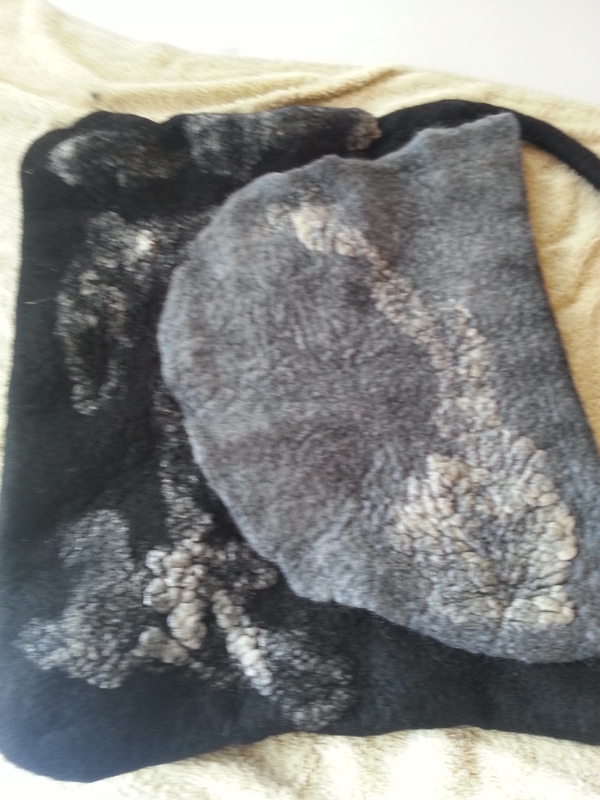 Well I didn’t post this yesterday so another day has gone by and I decided to create a Handbag, its been ages since I made one, below is a pic of it still as work in progress, I used a resist, black and grey Merino and embellished with white silk spun threads, I’ll finish it tomorrow. I’ve also had some great news that my very good friend Helena, has taken over Nicola’s old Studio at Duckets Grove in Carlow. Helena creates the most amazing knit wear for children and her Christening Gowns are a dream, she also designs her own Patterns. Using the Studio she is going to be holding Knitting Workshops for both Hand & Machine, so if your are local do check her out, “Kelly Maye Knitwear”, she’s on facebook so please check her out, I’m trying to persuade her to star Blogging. Also she’s going to be stocking some of my Hand spun pure wool yarn which hopefully will be great for me too. Heading off now as it’s late, too late and time for bed. Back soon. The weather is at last showing that Summer may be here, more fleece being washed, more spun, an order for some beautiful Jacob placed and arrived. This has come to me washed and carded, so I can spin straight away, at the moment I’m still trying to get spun Suzanna’s Zwatrbles for her, so the Jacob will have to wait until I’ve finished that, also my Galway has been flying out the door, along with my Merino. Many thanks to all the ladies who have been purchasing at the Craft Fairs. 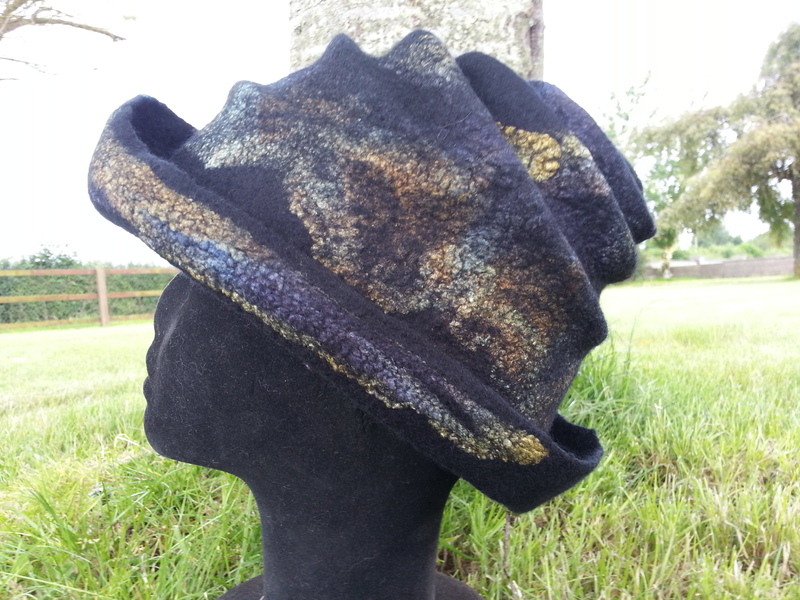 On the felting front it was a hat week, I love hats with a brim, mainly because I only look good with a brimmed hat and exploring different shapes and resists is something which I find fun and challenging. I was so pleased with the result and so was the lady who purchased on Saturday in Carlow, many thanks to her, it is so nice when my creations find a home. 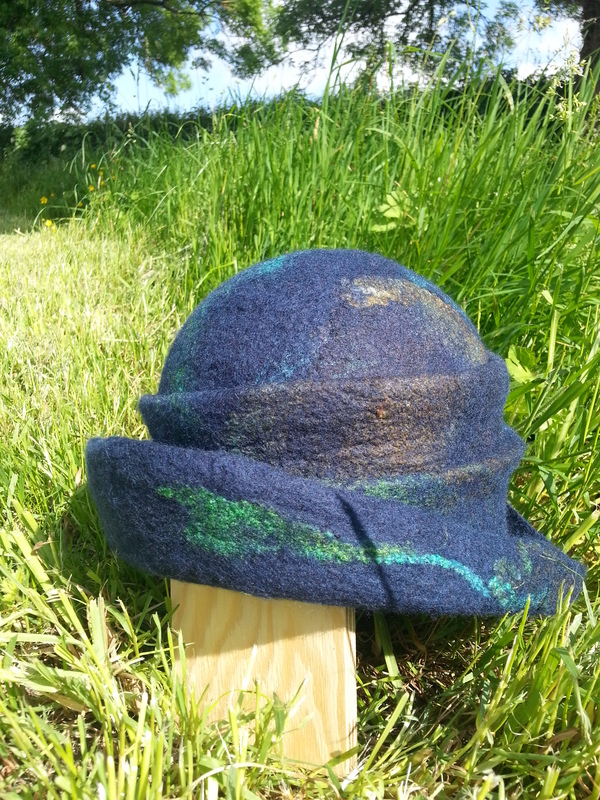 So this morning I thought another hat day, blue again with silk hankies and this time Tussah Silk, very similar to last weeks hat, but the shaping for the brim is slightly different. Shades of Peacock is its name Lol. On another note back to spinning, on Saturday I was at the Carlow Shopping Center with the Craft group and I met a lovely young lady with her Mum and Nana. She was so interested in my spinning, the fleece and felting, we must have chatted for about 20 minutes, to me it was so rewarding that she was so open to absorbing all I was telling and showing her and I got the impression, her Dad, Teacher and friends would be told all about it. She was so nice I gave her a wet felted flower attached to a head band for her, she was thrilled. So if her Mum or Nana happen to read this post, hi to you all and a special hello to my young friend. To finish pictures of Jacob fleece and new hat which is still wet and tomorrow I’ll look at any final shaping I want to do. Back soon and enjoy any good weather you may be having.